You are currently putting the final touches on your latest film, Crawler. What is this movie about? 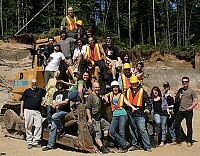 The main villain of your film is a 50 ton bulldozer. How hard was it to handle such a thing effects-wise? Well actually it wasn�t so bad, but we did write the story accordingly. We certainly don�t move a real bulldozer like we do a Tonka toy, so when we wrote the story, we took that in consideration. For instance, a dozer is slooooow. A man walking can outrun a bulldozer you know, so we had to find solutions for the shots where the dozer crushes workers to death. It�s all about being creative, finding tricks believable enough so the audience buy them and leave enough to the imagination for a maximum impact. It�s a lot about the story and concept and a bit about visual effects. A few words about the rest of your cast? What were your inspirations for Crawler? Well I had that idea in mind for quite some time now. Actually the first time I thought of a killer bulldozer was when I watched John Carpenter�s Christine. At the end of the film, the kids manage to kill the haunted 1958 car by crushing it with a bulldozer. When I saw that in the film, I was like: �Oh my god! The evil spirit in the car will now move into the bulldozer, and now it�s gona be total chaos!! !� But nothing like that happened, the car dies and the film ends there. So I�ve been thinking of a killer bulldozer ever since. There�s also a novel that�s been written by Thedoroe Sturgeon, back in the 40s, where a group of workers building a small airport on a desert island fight against their bulldozer that�s controlled by a space alien. They also made a TV movie out of it in the 70s, but it wasn�t that good. Our bulldozer story has nothing to do with Christine or the Sturgeon novel, Killdozer. 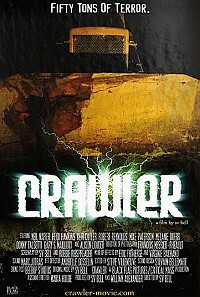 You can check more on www.crawler-movie.com or on my company website www.blackflagpictures.com. When and where will Crawler film be available? It�s hard to tell. The film is now available for distribution, and we�re closing deals left and right. At this time, the film is already available in Russia, and it even aired on Russian TV a few weeks ago. We recently sold for Czech Republic, and also Thailand. We�re working on deals for China, Japan, USA and Canada these days. I guess it should be available everywhere before summer 2010. Leaving the present behind for a while and moving ahead into the past: How did you get into filmmaking in the first place? Well it happened a bit by accident. I never planned to become a filmmaker, I was a painter and designer first. Back in the 80s and early 90s I was doing a lot of heavy metal cover artwork for UK and German record labels mostly. One day, one of the band I designed the front art asked me to work on their music video. I never worked with a camera before, so out of curiosity I said yes, let�s give it a shot. I loved the experience! I discovered that I could be telling my stories in moving images and not only in still pictures. Your first short is called Cold-Blonded Murders. A few words about this film, and how did you come up with the great title? The title came along as the film had some sort of comedy feel to it, and our killer was a sultry blond, I thought about replacing cold-blooded murder with cold-blonded. We shot that film within a single day, it was quite a filmmaking marathon... Editing took about three months, it was a learning curve. But overall I am not ashamed of the film, as long as people keep in mind that it�s been made under such a short timeframe. And the film is entertaining, that�s the important part. Lots of things don�t work in that production, but when audience watches it until the end without thinking of the remote control and the forward button of their DVD player, that�s all that counts. In Cold-Blonded Murders, Suzi Lorraine [Suzi Lorraine interview - click here] plays the lead, an actress who pops up quite regularly in your films. A few words about her? I met Suzi thru a friend of mine, Isabelle, who also stars in Cold Blonded Murders. From that point on, I worked with Suzi on a couple of feature films. But now that I am doing union productions, it�s hard for me to call her aboard, and hire a talent from outside the country. The local union would not allow that. What can you tell us about your short Irish Whisky? That was another effort in shooting a film in a short period of time. This one, though, took three days of filming, and I was starting to learn the ropes about directing. I was still doing pretty much everything myself, camera, sound, directing, and the crew was also expanding slowly, we were like twice as many people as we were in Cold Blonded. It was a fun experience, but the film should have been better. The story was more complex than Cold Blonded, but the actors were simply not good enough. Actually they weren�t even actors, just friends of mine who wanted to give a shot at acting. The Night They Returned was your first feature. What prompted the switch to go feature length, and what can you tell us about the film? Well I was feeling a bit limited with short films, I was feeling that I was lacking time to tell my stories... Just like when I was doing my paintings, I was feeling limited with a small canvas. It was only natural to move to feature lenght, I didn�t really think about the difference of jumping from shorts to feature length. I just wanted more time to tell my story. We shot The Night They Returned on week-ends, over a four weeks period. That�s 8 days of filming. The new thing I learned was how to manage a crew. We were now a huge staff of 15 people (!!) including the actors, and managing the set was something I never really worried about until then. 15 people asking you questions every 5 minutes is a lot to handle for the brain. On the last days of filming, I simply blacked out, burned, my brain couldn�t take it anymore, and I couldn�t even spell my name or read the time on the clock. It was a scary feeling... ! From there I realized that I needed an assistant-director, and start delegate tasks and trust people around me. Could you talk about Purple Glow for a bit? Purple Glow was a turning point. After The Night They Returned and the blackout I experienced, I started to delegate key positions on the set. I had an assistant to give me a hand on the set. I had a director of photography. A sound recordist. These were friends of mine with abilities to work in those fields, while not being industry professionals. So the quality of Purple Glow was already much better than The Night They Returned, the sound was better, and the lighting was convincing. Actors were also pretty good, and the screenplay was handled by a professional. All the elements to make a good film were there, but at this point, I was still lacking a bit of experience to make it all work at its best. Again, the film was cool, again with rough edges, technically speaking, but it still flows very smoothly during 80 minutes. 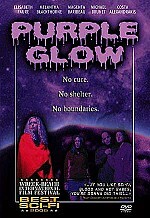 Once Purple Glow was released, I started to see possibilities of making movies that has potential for commercial distribution. With Purple Glow, I had a budget of $5000 (three times what I had on my previous feature) and I started considering investing more, as I was seeing there might be interest from the industry, and a way to recoup the investment. 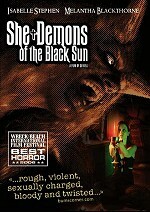 A few words about She-Demons of the Black Sun? She-Demons of the Black Sun was a turning point. It was the first film I made with the intent of presenting it to commercial distributors. We rented industry entry-level equipment. Had custom music written. Took more time for filming. Called in a professional special makeup FX artist. We were still a bit tight on the budget, but I placed high hopes on that one. Well not really that I wanted it to become a classic, but at least to have the film out there. I also made the film ready for the international market, with separated dialog track so the film can get dubbed into foreign languages. And it worked. I attended the American Film Market with a friend of mine at Movie Seals Productions, and we met international buyers in our suite there. That was the first contact I had with the industry buyers so it quickly became obvious what these guys were after in the business. Even though I did not get the distribution deals I wanted, I still received several offers from distributors, yet none of them were attractive enough so I would license the film. I kept all rights, released the film myself again, and only recently have I started to license it to third parties and studios in some European countries. So far, your last movie released is Rise of the Ghosts. What can you tell us about that one? Any film you've made I have forgotten? Well these days we�re slowly entering production on a new feature called Lifetaker. 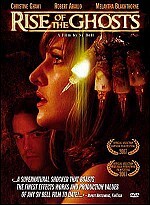 I posted a teaser of the film on my web site: www.lifetaker-movie.com. This one will be a film that�s more of a drama than horror, though Lifetaker does have an amount of scare, suspense and disgusting stuff. See it as a mix between Silence of the Lambs, Se7en, X-Files and CSI. I am not putting away horror content, but I wanted to do something more mainstream. Apart from films, you also direct music videos, right? I did, in the beginning, before doing short films. 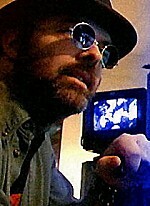 I haven�t worked on music videos for years now... ! Making feature films leaves me very little time to do anything else! I can�t point anyone in particular, but I absolutely love the films of Paul W. S. Anderson and Steve Beck. There is something fresh in their filmmaking. When I direct my films, I just go with the vibe of the moment, how I feel, what would be best for this type of film, for that type of moment. I am not trying to find a specific style, I am not looking to create my style, I just try to tell stories and tweak the film so it works in the end and is totally entertaining. Usually, you write, direct and produce your films yourself. Which part of filmmaking do you like the most, which the least? I like pretty much every aspect of it... ! From drafting the rough lines of the film, working with the screenwriter, building work schedule, casting, all the way down to closing books and dealing distribution agreements, it�s all very cool. Maybe the one thing I dislike the most is when it comes to a premiere and I have to introduce the film. I�m usually shy, I hide in the shades, and my place is behind the camera, not in front of an audience. Your films, gruesome as they might be, always seem to feature a certain amount of humour. What can you tell us about that aspect of your oeuvre? I don�t know, seriously... ! I simply feel that having a bit of good humour helps in getting the creepy moment more gruesome. But I don�t know, I like it that way, and make the film that way as well. You know I am very spontaneous when creating my stuff, whether it be a painting or a feature film. On the way I shuffle things around, move it all over, replace things, and make it work in the end. You know, when you are getting ready to shoot a film, it�s critical to establish a precise road map, from point A to point B. And once you get on the set, it�s all about finding shortcuts on your roadmap to reach point B. That was a few years ago... My job as a painter led me to making films, and now I have little time to spend in front of my easel sadly. Maybe later I will get back to my brushes. Every now and then I get calls or e-mails from bands or record labels to paint something for a CD release, but I simply can�t do it in a reasonable amount of time so I prefer to pass on. Back in the 90s I was pretty busy doing artwork though. I could earn a living out of it, painting two or more Cd cover artwork every month for record labels in UK, Germany, France, and USA. I sometimes still do some graphic design work, but I just don�t take everything that comes my way. Anything else you are doing we should know about? They are many... ! But if I have to point one, that would certainly be Event Horizon. I can�t get enough of that film, I must have watched it a hundred times already. There is something in that movie that makes me think like �wow � that IS a film I wish I have made!� Another one that I like a lot is Ghost Ship. This is one great piece of film, and is also similar to Death Ship, made in the 80s. Movies taking place on the water are usually winners to me. Not really... Every film has a purpose, maybe those that I am not much into are the remakes. I mean, come on, don�t waste time and money on redoing something that someone made before... It might not have been perfect the first shot, but it�s done so let�s move on to something else. I don�t mind sequels, but remakes? *sigh* But I won�t bash too much though, who knows, maybe one day I might be commissioned to direct a remake myself for a given studio...!! I guess that�s about it... !